Temperatures in April will be warmer than average across a large part of the western and central United States, according to an updated outlook released Friday by The Weather Company's Professional Division. 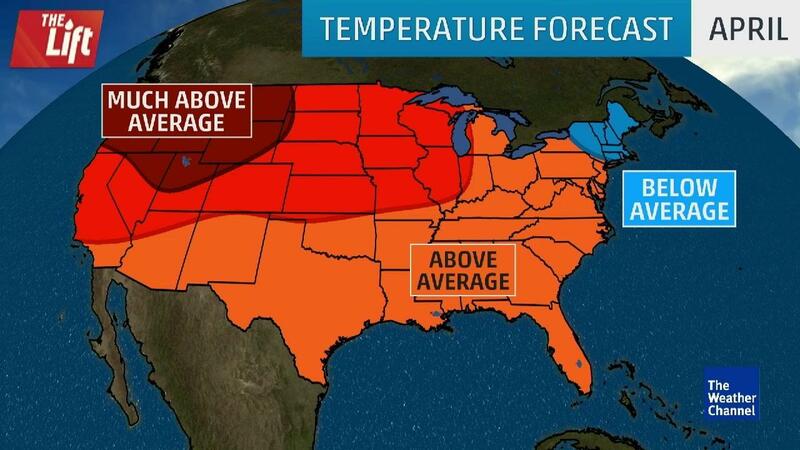 A swath from the Midwest to the West Coast is expected to see temperatures the farthest above average. The most unusual warmth when compared to April averages is expected in Wyoming, Montana, northern Utah, northern Nevada, Washington and Oregon. "All signals point to a very warm and dry month in the western United States in April," said Dr. Todd Crawford, chief meteorologist at The Weather Company's Energy division. With the dry season kicking in for that region of the country April to May, this may close the door on the prospects for any significant additional rain and snow there for the rest of spring. The only region forecast to see slightly below-average temperatures overall during April is New England. This is mainly due to colder temperatures sweeping in for the first part of the month in that region. Elsewhere in the East, slightly above average to near-average temperatures are forecast from the mid-Atlantic into the South. "The first couple of weeks of the month will likely be characterized by very warm temperatures across the West, and normal to below-normal temperatures across the East," Crawford said. During the second half of April, the weather pattern is forecast to flip to a warmer one in the East based on the latest guidance. However, uncertainty remains, and there is a chance that a cooler pattern could continue in the East for late April. Keep in mind, this outlook for April is the overall trend for the entire month as a whole. An individual cold front or an upper ridge of high pressure can lead to a brief period of colder or warmer weather, respectively. The summer 2016 forecast remains unchanged from what was issued in mid-March. Below are the details on what to expect June-August. Well-above average temperatures are expected this summer for the northern tier of states, from the Pacific Northwest into the northern Plains, Great Lakes and Northeast. Warmer than average temperatures will also extend from southern California into the central and southern Plains and Southeast. The only area where cooler than average temperatures are currently expected this summer is for portions of central and south Texas. "The historically strong El Niño event is weakening rapidly and we should transition into La Niña conditions by summer and model guidance shows a rather dramatic reversal of the background tropical Pacific forcing signal that would favor a hot summer again, especially across the northern U.S.," said Crawford. "There is a historically large amount of background global warmth around that will likely skew all temperatures towards the warmer side for the next few months, as the impact of the El Niño works its way through the system; thus it will be generally difficult to forecast widespread or significant below-normal temperatures through the summer at least." One of the factors to consider regarding temperatures this summer are sea surface temperatures in the Atlantic, which are forecast to be warmer than over the past five years. This would help to lead to a hot summer, especially in the East. As mentioned above many computer forecast models are suggesting that the strong El Niño will transition to La Niña this summer. Typically, La Niña summers feature hotter temperatures from the central U.S. into the Northeast, with the hottest month being July. Crawford points out that during other years where rapid changes from El Niño to La Niña occurred, "the summer heat is centered in the northern Plains into the Great Lakes states." Overall, computer forecast models are highlighting widespread warmth, with little hint of cooler than average temperatures in the U.S. There is the chance of cooler than average temperatures in the Southeast and West. However, above-average temperatures are expected to prevail across the West due to the influence of the strong El Niño we saw this past winter.